Dan Clucas began playing trumpet at age ten and started playing in school jazz groups a couple of years later, becoming a lifelong devotee of the music upon first hearing *An Electrifying Evening with The Dizzy Gillespie Quintet* at fifteen. Later forays into the music of Ornette Coleman, Cecil Taylor and the Art Ensemble of Chicago led to an appreciation of a diverse array of artists in the African-American music continuum, not least of them Julius Hemphill. Clucas has studied with cornetist Bobby Bradford and trumpeter/composer Wadada Leo Smith, and has performed extensively in the Los Angeles area as well as the Pacific Northwest and New Mexico, where he co-founded DO TELL with Dave Wayne and Mark Weaver in 2009. He is a lifelong resident of Southern California, currently living in Pasadena, that city northeast of L.A. where Bob Bradford has taught so many so much. Tuba player, composer, bandleader from the center of the vibrant arts community of Albuquerque, New Mexico,Mark Weaver has been operating for years to make creative music happen in many ways. A trombone and baritone horn player in high school, Mark was 26 years old before he finally realized that it was the sound of the tuba for which he was looking. Since then, he has performed, toured, and recorded in a range of music ensembles including jazz combos, free-improvisation and new-music groups, poetry+music ensembles, and collaborations with film and theater productions. He is a composer with dozens of his pieces on record with various ensembles. 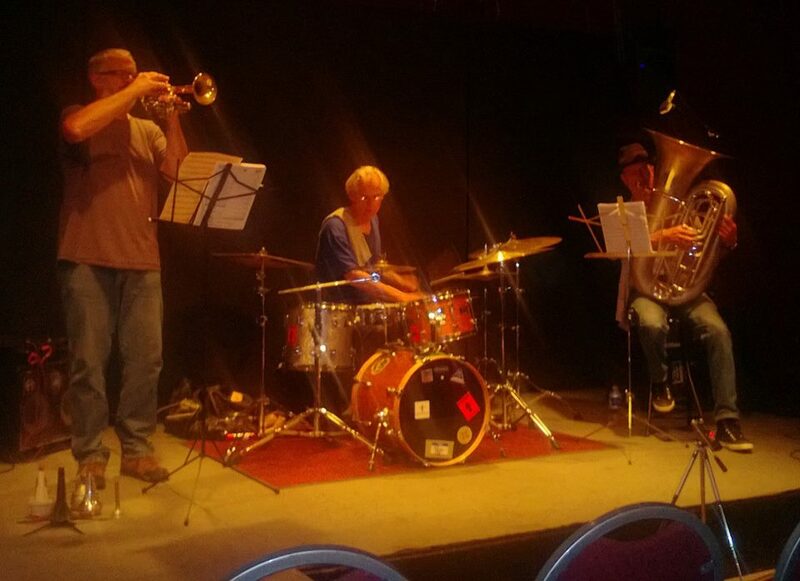 In 2012, Mark's group UFO Ensemble (a brass and drums quartet exploring Mark's compositions) was selected for a featured performance at the annual UNM Composer's Symposium/Outpost Creative Soundspace Festival. Additionally, Mark has been responsible for producing a great many regional music events with local and international artists, most notably "THE ROOST Creative Music Series" (TheRoostABQ.com), now in its seventh annual season. His collaborations include works with J.A. Deane, Anthony Braxton, Malcolm Goldstein, Harris Eisenstadt, Jeff Kaiser, Butch Morris, Tatsuya Nakatani, Roswell Rudd, Damon Smith, and Biggi Vinkeloe. Born in Philadelphia, PA and grown in Pompano Beach, FL, Dave Wayne was captivated by music thanks to his older brother who introduced him to Frank Zappa, Captain Beefheart, Muddy Waters, Gary Burton and Jimi Hendrix. Essentially self-taught on drums he was formally educated as a geologist. Since moving to New Mexico in 1993, Dave Wayne played with a number of innovative and accomplished NM based artists including Mark Weaver, double bass player Ben Wright, Scott Jarrett, saxophonist Chris Jonas, pianist Robert Muller, poets Robert Winson and Mark Weber, guitarists Stefan Dill and Ross Hamlin. Thanks to the chance to perform with touring musicians such as Dan Clucas, keyboardist Brian Haas (of JFJO), guitarist Jeff Platz, saxophonists Andrew Lamb, Rob Brown, Alan Lechusza and Joshua Smith, trombonist Michael Vlatkovich and bassist Clyde Reed, Dave developed his own style and a great flexibility. In 2009 he formed his own band – The Things That Are Heard – in order to air out "...my half-baked ideas concerning the relationship between composition and improvisation in music". Dave Wayne continues to compose and play music for local jazz and jazz-rock groups. His playing has been documented on a fistful of albums, both privately issued and on labels such as pfMENTUM, Plutonium, Snowdonia, and Zerx. In addition to playing music, he's a husband, father and homeowner, works full-time as a scientist, maintains a collection of ~9000 records and CDs and writes music reviews for AllAboutJazz.com.